In addition to our weekly lawn services, we also offer annual lawn services for those who need assistance on a less frequent basis. Our annual tine raking service is usually done around April or May. 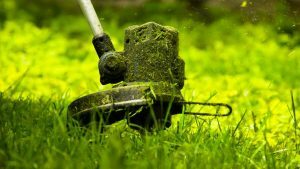 This process is done with a specialized piece of equipment that rakes out thatch from your lawn. Thatch is dead grass that accumulates and makes a barrier between the grass roots and the soil line. A severe thatch buildup can cause turf grass death as well as a soft spongy lawn that is difficult to walk on (or otherwise use for recreation). We highly recommend thatch removal through our tine raking service. We provide an annual spring cleanup that is performed in March or April (or as Mother Nature permits). This operation includes, but is not limited to, edging of planting beds, tine raking, fertilization and pre-emergent weed control, and removal of debris caused by winter storms.